A lot of people believe that this book —The Lean Startup — is only for startups. But the truth is that it's for pretty much anyone working on a product in some for or the other. I would recommend Eric Reis' The ﻿Lean Startup to 99% of the people I know. Eric Reis argues that you could be an entrepreneur and not even know it! Entrepreneurs are everywhere - whether it be a basement, an overcrowded office space or even a large corporation. We've all heard the notion "build it and they will come". But the notion begs the question. Who will come? Will they REALLY come? When will they come? Under what conditions? As product development managers and entrepreneurs, we tend to have answered these questions in our mind already. After all, we are visionaries, right? Right. The answers that we come up with have little to no value because they stem from assumptions. They are simply starting points that require additional investigation. They are essentially a hypothesis. And every startup hypothesis must be tested & validated. Eric Reis proposes a Build-->Measure-->Learn feedback loop. Reis advocates against making complex & rigid plans based on mere assumptions. Instead, we should first Build the minimum viable product (or feature). After that, we should Measure whether or not it yielded the expected results. This is the phase where we validate or invalidate our assumptions (our hypothesis). Finally, we Learn how to build a sustainable business from our findings. In this manner, we can quickly figure out whether or not we should steer our product toward a path of success, or pivot. Peter Drucker, author of The Effective Executive, said that "there is surely nothing quite so useless as doing with efficiency what should not be done at all". Even in 1967, Mr. Drucker advocated 'getting the RIGHT things done' as opposed to simply 'getting things done'. Avoid 'Quality Featuritis'. Quality featuritis is the act of releasing as many features as possible with the highest quality possible. Instead, scale down on quality and first test & validate the feature. MVPs are your go-to here. Release the barebone feature(s) to needed to validate the value. Sometimes, you may find that your audience wont take the first steps to even subscribe to the idea of your product/service.​ If this turns out to be the case, it's imperative that you find out before product development begins! Big Idea #3: Don't argue about effort-prioritization - Use Split-Tests & Cohorts! Once you figure out what to build, the next biggest waste of time is arguing about where to prioritize efforts. This often leads to missed growth opportunities. What should be the focus? Quality? Customer? Price? More features? If the product team picks one based on assumptions (or gut feeling) - how will they know that's it's really working? You may say "well -- if it's working, they'll grow--duh". This is where things get dangerous, because a product may grow (temporarily) even when the wrong engine of growth is picked. Leading to a false sense of 'success'. This only leads to a plateau in growth in the coming future. Lean Startup Nugget: Growth may be attributed to the wrong feature! Growth may be attributed to a feature that had nothing to do with it at all. Was it really that cool new feature that resulted in the sudden spike of new registrations? Did those thousands of marketing dollars really increase new member activation numbers? This needs to be tested & validated! Assumptions to these questions will cost time & effort. Did that additional software feature really cause the spike in growth? If not, maintenance of the code may not be worth it. Was it the marketing efforts that led to success? Split-testing allows the product team to answer these questions rapidly and almost instantly. Segment your customer base and use cohorts to identify the market your testing . Release versions of the products with & without the engine of growth you picked. Validate your engine! Tune it accordingly and when it's time, rev it up! ​Big Idea #4: You might be an Entrepreneur and not even know it! Eric Reis defines a startup to be 'any institution designed to deliver a new product or service under extreme uncertainty' The key words there are 'new - product - service - uncertainty'. There's nothing in that definition that specifies the size of the company, the industry or the amount of funding received. You may very well be undertaking a new project geared toward innovation, within your company, that you're not entirely sure that will pan out or not (uncertainty). In 1985, Grifford Pinchot wrote a visionary book 'Why you don't have to leave a corporation to be an Entrepreneur'. He defined an intrapreneur to be someone who takes hands-on responsibility for creating innovation within a business . An intrapreneur should be provided (or facilitate) an environment where experimentation and validation is enabled. Distinguishing between 'entrepreneur' and 'intrapreneur' based on where they operate tends to construct an environment destined for failure. In large organisations, it's the responsibility of the senior management to recognize that there is a need for an environment that fosters innovation. This is done via constant testing & rapid learning via experimentation. The truth is entrepreneurship is a form of management. But it needs a different outlook. Traditional tools in management tend to rely on the certainty of outcomes. But in any startup the only thing you can be certain of is that mostly everything is uncertain at first. Lean Startup Nugget: Manage the certainty of uncertainty! Thus, the management of entrepreneurship should be geared toward the certainty of uncertainty. An entrepreneurship environment will allow for rapid testing & experimentation. This will allow for an environment where employees aren't afraid to fail in order to learn. More importantly, this will prevent wasting an organizations time & resources by avoiding vanity metrics! This takes us to our next gold-nugget - using actionable metrics versus using vanity metrics. When undertaking a new venture under extreme uncertainty, the pressure to show consistent success can be intense. As such, leaders of the product team tend to use vanity metrics to portray an appearance of growth. Vanity Metrics are essentially 'growth' numbers that don't really indicate whether or not the business is truly growing. For example, using a temporary marketing campaign to show increased 'views' is nothing but success-theater. Instead, teams should use actionable metrics. So, if a company showed that for every 80 cents of marketing dollars, it generated 1$ from new user registrations -- the company has successfully shown a 20% engine of growth. This is an actionable metric that can be used to tune the engine. Now to increase growth, the company knows that it can either increase the user registration costs, or drive down the marketing cost to acquire a new user registration. If you've read through the post (or even skimmed the highlights) you've probably figured out that the importance of experimentation is major point to grasp . Every startup endeavor (whether a two-man team or within a large corporation) should be looked at as one grand experiment. Eric Reis attempts to drive this point via the The Lean Startup framework. No time to read the entire book? 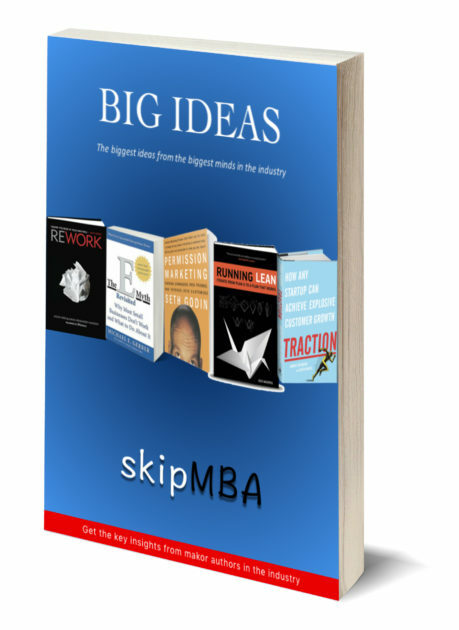 I will be writing a book summary where I'll highlight the key take-aways ! If you want to be updated on when that post is out subscribe to my newsletter!